The geographic areas they serve. The products they prefer or use most. The vendors with whom they are formally affiliated. The professional organizations to which they or their employees belong. These details are provided by the listed companies themselves, but a live editor reviews all new submissions for relevance and periodically removes old listings from companies that have gone out of business. 1. You construct a web site that most effectively conveys your message to prospective new clients. 2. You summarize your message in an Automation Integrator Guide listing and send it to us. If you’d like top billing in our search engine, you also pay a listing fee (optional). See Pricing for details. 3. 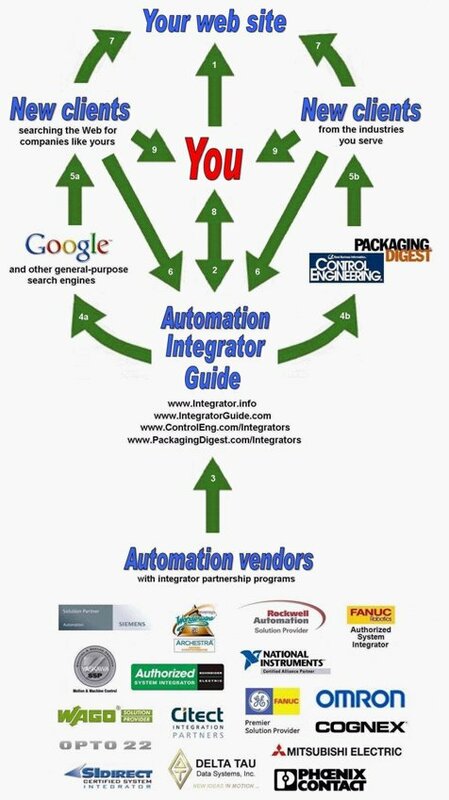 Several automation vendors with integrator partnership programs also sponsor the Automation Integrator Guide with advertisements and listing fee subsidies for their partners. 4a. We pool all the listing fees we receive and pay Google for top billing in their search results. 4b. We send your listing information to industry-specific trade magazines for various hard-copy editions of the Automation Integrator Guide. 5a. Google displays our ads to your prospects as they are searching the Web for phrases like "system integrators", "automation engineers", and "panel builders". 5b. Our magazine partners publish and distribute hard-copy editions of the Automation Integrator Guide. Paid listings include more details than free listings. 6. Your prospects visit our web sites and specify the kinds of integrators they’re looking for. Our search engine displays all listings that match a prospect’s search criteria with paid listings at the top of the list. 7. Prospects who find your listing and want more information click through to your web site or send you an e-mail. 8. We report to you on the number of visits, click-throughs, and e-mails that your listing has generated. We can’t identify your visitors, but we can tell you exactly what they were looking for. 9. Prospects who find what they’re looking for on your web site come to you for help with their projects.